Enjoy a luxury holiday in Kalkan with Diamond Sky Holidays and take advantage of our outstanding value 5 star Kalkan holidays deals this year and in 2019. We are specialists in luxury holidays to Kalkan and across Turkey with a fabulous collection of 5 star hotels to choose from at the resort. Get in touch to enquire about our luxurious breaks at this resort. 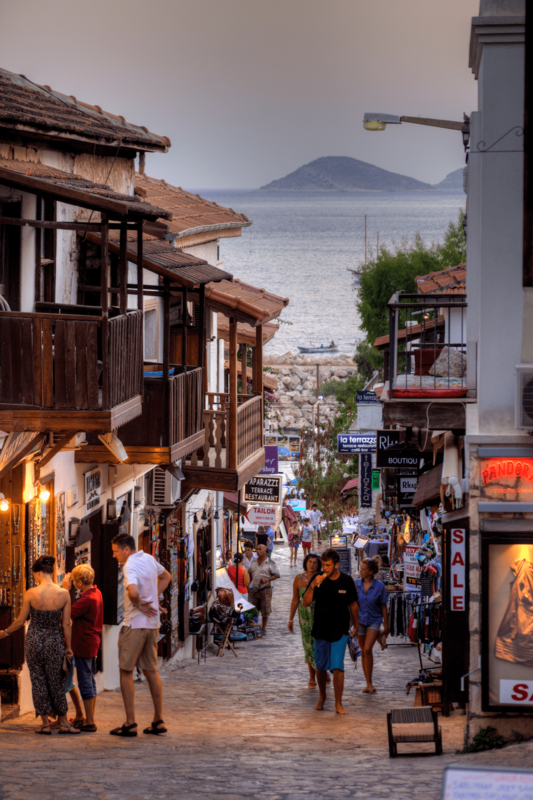 Kalkan is a harbour town which just oozes the flavour of Turkey . You will be enchanted by its narrow streets and cobbled alleyways leading up the hillside surrounding the harbour. Kalkan is the kind of laid-back, lazy resort where time can pass doing virtually nothing except relaxing, soaking up the atmosphere and enjoying your holiday. Spend your days swimming in the clear Mediterranean waters, perhaps from one of the many seafront ‘beach’ clubs, where you can also enjoy watersports such as waterskiing and jetski. Then, what could be better than an early evening promenade through the narrow streets to explore the charming shops, before settling down with a cold glass of wine to admire the views over the harbour-front. Kalkan has an excellent choice of restaurants serving authentic local cuisine and freshly-caught fish, as well as a number of lively bars. With over 25 historic sites less than a two hour drive or boat trip away, Kalkan is a great base for exploring the surrounding area. We have a full programme of tours with English-speaking guides covering most local places of interest. 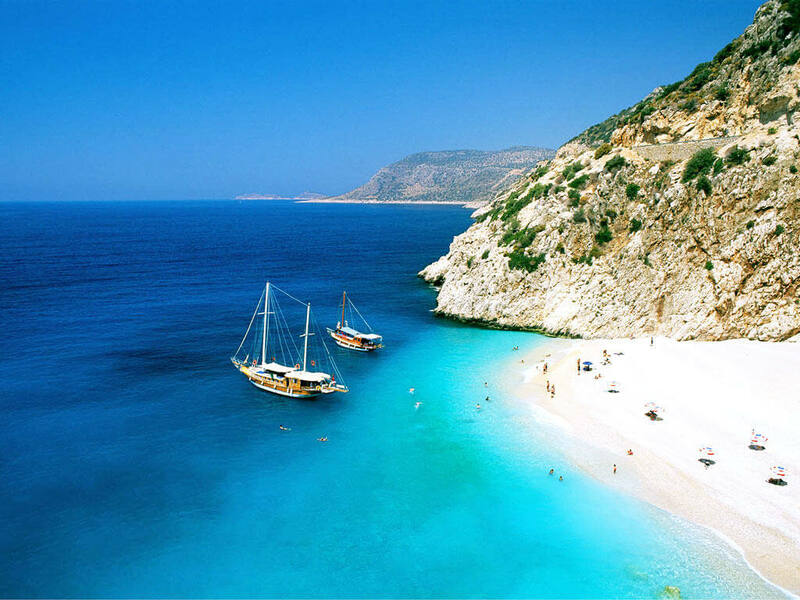 For beach-lovers, Kalkan has its own small pebble beach or head out of town to the nearby beautiful beaches of Kaputas or Patara – only 20 minutes away and both easily accessed by a regular dolmus (minibus) service from the centre of Kalkan at a minimal cost. Kaputas is a fine, shingle beach, with sea the most unfeasibly bright turquoise colour you have ever seen. Patara, on the other hand is an 11 mile stretch of golden sand, with a wonderfully atmospheric ruined Roman city, including a 10,000 seat amphitheatre, which lies half-buried in the sand. It is certainly easy to understand why Kalkan has such a loyal following amongst our clients, with many of them returning year after year. It proves particularly popular with couples of all ages, who appreciate the relaxed ambience, the authentic atmosphere and the beautiful setting. Dalaman Airport 135km (1 hr 45 mins drive); Fethiye 85km; Saklikent 55km; Dalyan 150km; Kas 35km. We have a full programme of tours with English-speaking guides covering most local places of interest. For tour information and prices, speak to our representative in resort. Kekova Island offers some of the most picturesque of the Lycian ruins. The ‘sunken city’ lies submerged just off the coast of the island in the crystal-clear water, its ornately carved columns protruding from the sea. Spend a peaceful day gently canoeing down the Xanthos River, stopping for a delicious barbecue lunch and finishing with a fabulous muscle relaxing mud bath! The Kalkan region is reputed as some of the best diving in the world, certainly among the best in Turkey. Apart from an abundance of fish life, the big attraction is the many wrecks which lie beneath the surface. Visit the world’s first parliament building in the ruins of the ancient city of Patara, which was the birthplace of St. Nicholas, the real Father Christmas. 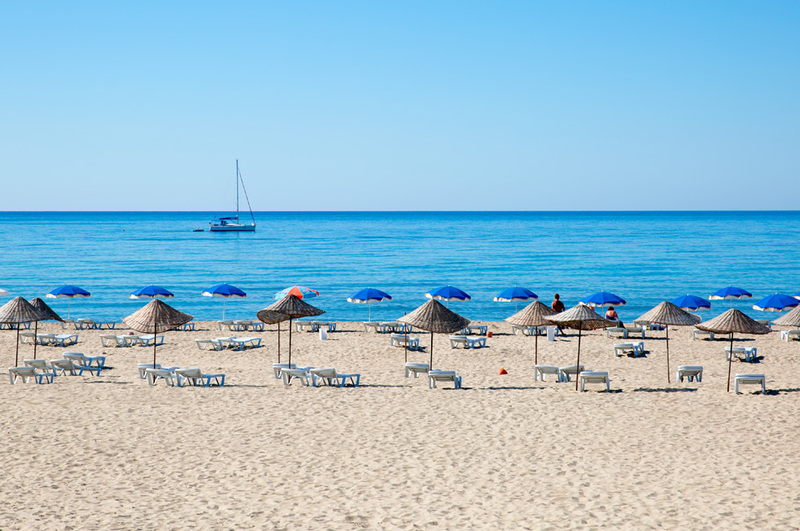 Patara is also renowned as being one of Turkey’s most stunning beaches, boasting some 11 miles of fine, golden sand. This will be one of the most unforgettable days of your holiday. Have a lazy day out, sunbathe, swim and relax. Sun hat, sun cream, camera and swimwear recommended. Fethiye itself is a charming traditional harbour town where the everyday hustle and bustle of fishermen, sailors and tradesmen go about their business. After visiting the biggest gold centre in Fethiye, try out your bargaining skills at the huge market. Start the day at one of the oldest and most important Lycian cities, visiting the spectacular rock tombs, Roman theatre and bath, and the Ottoman castle. After a relaxing lunch explore the spectacular mountain gorge of Saklikent, the second longest canyon in Europe.